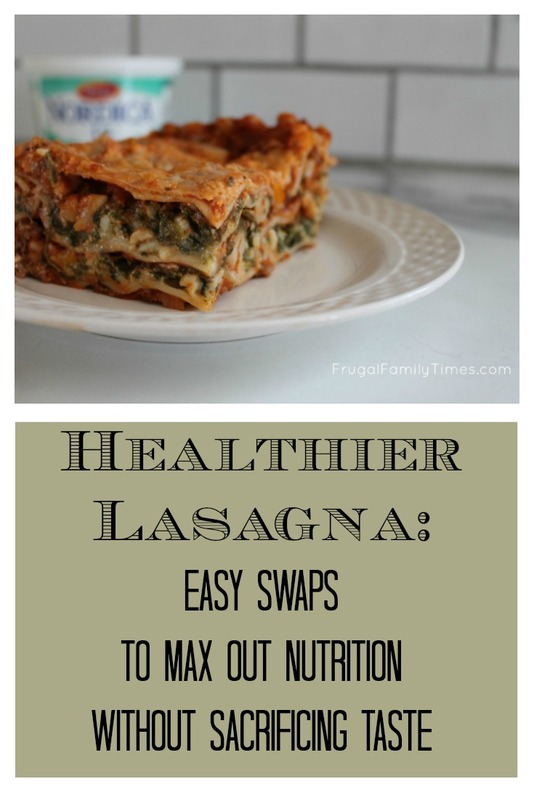 Do you have a favourite lasagna recipe? This one's mine. I've been making it for about 15 years, with a few improvements along the way. You might know, I'm a Registered Dietitian, so it's in my job description to pump everything I can with nutrients. But, I'm also a real person who won't sacrifice taste for nutrition. This recipe is a nice balance of the two. I love teaching people how to make easy swaps to familiar recipes. This recipe is a great example of a few helpful principles. Here're the swaps I used to create this healthier version of an old favourite. 1. Swap in Whole Wheat Pasta. If you don't mention it, your family likely won't notice if you use whole wheat pasta in place of white. I've done this for years and now this is the norm for us. For most kinds of pasta, this is easy-peasy - just a straight swap. Whole wheat lasagna noodles are a bit more difficult - I've yet to find them available in oven ready form. Which is a drag, because I'm way too lazy to precook them. 2. Pump up the Jam Veggies. With most recipes you can add more veggies than the recipe calls for. You'll gain fibre, phytochemicals, minerals and vitamins. Start with 50% more and inch up from there if you can. For this recipe, I've included more peppers and added chopped spinach. Frozen spinach works really nicely here - it's prechopped and usually more affordable than fresh. 3. Use a Smidge Less Cheese. Cheese is pretty key to lasagna. If you want your family or guests happy, don't mess with this one too much. 25% less will usually go unnoticed - that's what I did here. Usually, I actively dislike light cheese - often the taste and texture are not worth eating, but in this recipe - it works great. 4. Substitute Cottage Cheese for Ricotta. This swap is a no brainer. For this lasagna, I simply used Nordica 1% cottage cheese in place of the ricotta. This saved fat and added protein (15g per 1/2 cup) and it's a great source of calcium. 2. If your noodles are not oven-ready: lay dry lasagna noodles in a 9X13 pan. Cover completely with hot water. Let soak while the sauce is prepared (approx 20 minutes). Then drain water. 3. In a large saucepan, heat oil over medium heat. Cook peppers and onion for 8 to 10 minutes. Stir occasionally, or until onion is translucent. 4. Add lean ground beef and spices. Cook, stir until no longer pink. Drain off excess fat. 5. Stir in pasta sauce. Cook until heated through. 6. Meanwhile, in a small bowl, stir together cottage cheese, spinach and egg. 7. Set aside 1 cup of mozzarella for the top. 8. In a 9X13 inch baking dish, spread 1 ½ cups of hot meat mixture over the bottom. Layer with ¼ of the lasagna noodles, 1/3 cup mozzarella, 1/3 of the cottage cheese mixture and 1/4 of the sauce. Repeat layers twice. Add remaining noodles sauce. Sprinkle with reserved mozzarella. 9. Cover the pan tightly with foil. Bake for 45 minutes. Remove foil. Bake for 15 minutes longer, until noodles are tender, mozzarella is golden and lasagna is bubbling. If your noodles are not oven-ready: lay dry lasagna noodles in a 9X13 pan. Cover completely with hot water. Let soak while the sauce is prepared (approx 20 minutes). Then drain water. In a large saucepan, heat oil over medium heat. Cook peppers and onion for 8 to 10 minutes. Stir occasionally, or until onion is translucent. Add lean ground beef and spices. Cook, stir until no longer pink. Drain off excess fat. Stir in pasta sauce. Cook until heated through. Meanwhile, in a small bowl, stir together cottage cheese, spinach and egg. Set aside 1 cup of mozzarella for the top. In a 9X13 inch baking dish, spread 1 ½ cups of hot meat mixture over the bottom. Layer with ¼ of the lasagna noodles, 1/3 cup mozzarella, 1/3 of the cottage cheese mixture and 1/4 of the sauce. Repeat layers twice. Add remaining noodles sauce. Sprinkle with reserved mozzarella. Cover the pan tightly with foil. Bake for 45 minutes. Remove foil. Bake for 15 minutes longer, until noodles are tender, mozzarella is golden and lasagna is bubbling. Disclosure: We are part of the Gay Lea Ambassador Campaign and receive special perks as part of our affiliation with this group. The opinions on this blog are our own. Do you have a yummy dairy free option? My body is rebelling against me. Hmmm - I'll have to think on that one, Lesley. Lactaid tablets? This looks wonderful! I particularly like the clear photos and instructions for the preparation of this dish. You are a true professional! Simple and healthy! Thanks for sharing this recipe! I will try ot out!